Jenny Davis ’17 may be a college senior, but she dresses like the stylish grandmother next door. For the past two years, she has kept the “Who Wore It Wes” column alive. In that time, she’s been a Features Editor, an Opinion Editor, an Editor-in-Chief, and is now an Executive Editor. 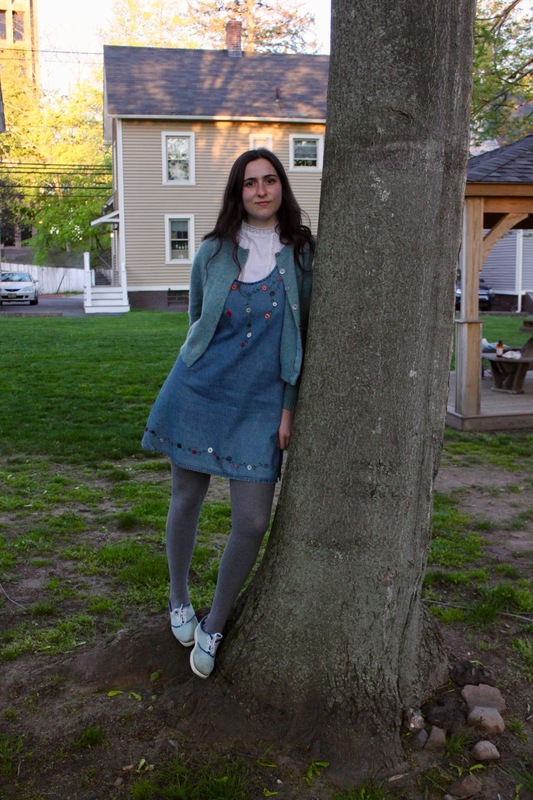 As a soon-to-be college graduate, a published author, and a “twee party” hostess, Jenny is also one of the most important Wesleyan fashion icons never to have been featured in this column before. Now, for the first time ever, we get to sit down with Jenny and Google some of the obscure vocabulary she’s picked up during her time as an English major. The Argus: How would you describe your style in three to five words? Jenny Davis: Let’s see. Prim [laughs], doo-wop [laughs], candy [laughs], and floral [laughs mutedly]. A: Where are you from, and how has that influenced your style? JD: Wow. So I’m from New York and I went to a high school that had a uniform, so I didn’t really think about what I wore until college. And then I think I had too much freedom, so I began to experiment. I was so unused to having to dress myself. A: Where do you shop? JD: Etsy. I’d say 80 percent of my clothes are from Etsy, and most of the rest are from thrift and vintage stores. When I was studying in Iowa last spring, I found three really amazing, inexpensive, typically Mennonite-owned thrift stores. I found a lot of my best housecoats and nightgowns from there. Probably 80 to 90 percent of what I own is vintage, but I do buy new tights and shoes, sometimes. Those are contemporary. A: Are you interested in fashion as an industry or in following trends? JD: Decidedly not. I’m sometimes interested in certain designers, but the extent of my interest is reading the New York Times style section and the New York Times Style Magazine and looking at pictures of recent fashion shows. I really love Prada and Jason Wu, who dressed Michelle Obama for the first inauguration. I’m utterly uninterested in so-called menswear. A: What’s your perception of fashion at Wesleyan? JD: I think there a lot of things here that I personally would never wear, but look good on other people. A lot of people wear pants here—they’re kind of a trend—but I’m not really into pants. I think people could wear more colors. It’s a little bit drab sometimes. I’m glad that people are usually not afraid to wear outlandish outfits here. I don’t like beanies—I hate beanies [laughs]. And I don’t like Blundstones or overalls. You know, for myself. Other people look fine in them. I love clogs. My dream is to get a pair of really ornately painted vintage Dutch clogs. And maybe, like, a Renaissance scene depicted—like da Vinci’s “The Last Supper,” half of it on each clog. But I’m really not picky. A: What are you looking to add to your wardrobe? JD: So usually I would not say this, because I think that pants are typically both unflattering and uncomfortable, but I’m really enamored of culottes and am searching for a suitable pair. I’m always looking for more dresses from the 50s and 60s, because the silhouette is really unparalleled. I like vertical stripes, and I really could get more into jumpers. I saw a toddler in a TV show wearing a jumper that had a huge fuzzy bear in the middle, like the whole jumper was kind of the bear—the bear’s face—and I scoured the internet for an adult-sized version of it, but I couldn’t find it. It was so cute. I also really want a vintage gym suit from the 40s to work out in. Maybe something with someone’s name stitched into the chest, with bloomers, possibly. Because in every historical novel from the 40s, the girl is humiliated to wear these, but I looked them up and think they’re precious. A: How has your style changed over the years? JD: I think it’s just become more pronounced. I’ve slowly purged my closet of everything that I really don’t wear, so now everything that’s in circulation is something that I really love. So I don’t have many clothes, but everything that I wear, I love. I got rid of a few things that I hated. I’ve just kept acquiring more dresses and skirts that I thought were really special, for whatever reason. I also think I’ve become more embedded in the time period I usually dress from. Nineteen fifty-eight to 1962 is really my window. But I’m not exclusive. I have a few things from the 80s and 90s and 70s. A: Who are your style icons? JD: Jackie Kennedy is number one, always number one. All of the characters in “The Young Girls of Rochefort.” Dutchess of Cambridge Kate Middleton, I think, has absolutely fabulous taste. And my grandmother, who worked in fashion for a long time. I get all of my sweaters from her. She’s a sweater fiend. Every time I go to her apartment I wear things under the pretense of borrowing them, and I just take them home with me. A: What’s an article of clothing you couldn’t live without? JD: I feel stressed by the prospect of having to choose just one. But probably my housecoat [named] Jane Eyre. I wear her pretty much every day around the house. She has, like, a big Peter Pan collar and silver buttons. A: Do you ever wish you could dress other people? JD: Well, for my upcoming birthday in late May, I want to host a “twee party,” like a tea party but called a twee party, where I clothe all of my guests in slightly different pastel dresses. We will have tea and vegan cookies and cucumber sandwiches without mayonnaise [laughs excessively], and there will be lots of flowers. Wooh! Jenny is #1 dresser in all of NESCAC!